I do not know where to start with. It was released worldwide on 17 July 2015. Of course, like most of the hindi movies this one also screened (still going on) at AMC 25, New York City which is literally backyard to me (about 1.2 miles). But I haven’t thought about going that weekend. And then I tried to go every day in that week including the following weekend, but I could not. Then the following week on Monday, 27 July, I went to my volunteer activity (teaching) after work and I had to pass AMC 25. That day as the school is closing for summer break in a few days, not that many students were attending and I had no student to work with and I was asked to go. It was around 6:25 and there is a show at 6:40 and I told my self “ok, I am going today for sure”, guess what I was in the line (not a big line, as there were many lines, I was second in the line where I was standing, and it is AMC 25, so there are so many movies being screened) and a lady is shouting (may be their electronic system failed to display the status on the screens) that the tickets were sold out for 6:40 Bajrangi Bhaijaan show, until after she shouted for a few times, I haven’t paid attention to her. It is that popular. so the next few days I was in a popular dilemma “to go” or “not to go” – So finally I tried on Friday, 31 July (3rd Friday after the movie release). The show was at 7:55 and I was at the theater by 7:30, bought the ticket and walked up several escalators to go to the 6th floor, and the theater was almost full except for the first 5 rows. I could get an aisle seat on 9th or 10th row. slowly the first rows rows also been filled up. 3rd Friday after the movie’s release and that was the craze ! I do not remember what (when) was the last movie of Salman Khan’s I have seen in the theater or even on the DVD. I haven’t seen any of his so called blockbusters. 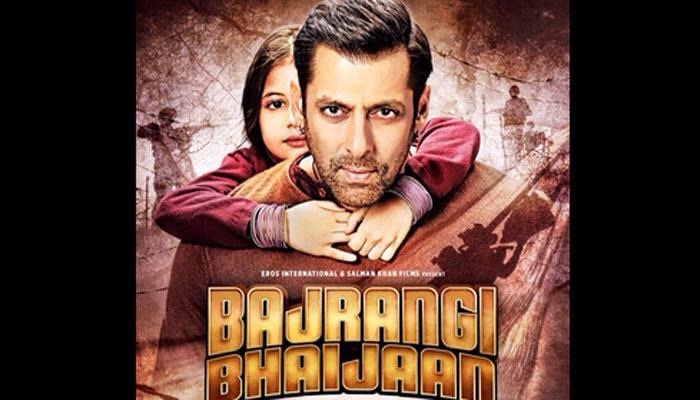 So coming to the main thread – 🙂 Whom/what should I talk about – the amazing performances of Salman Khan, Harshaali, or Nawazuddin – top notch performances from these 3 artists. The screenplay is very impressive and intelligent at times – intelligent – t he way a series of scenes just unfold to get to know the identity of the girl. Subtle comedy – few scenes – Every passenger in the bus becomes actively involved in providing the names of the cities when Salman Khan was trying to find the city that the girl belongs to and asks her to nod when he says the correct city and started speaking out the city names …. and another scene in Pakistan – where at some point of the story Salman Khan says Rama would take of the situation and Nawazuddin jokingly asks “even in Pakistan” and Nawazuddin asks Salman to walk like a lady when Salman was wearing a bhurka. There are many scenes with very subtle comedy. The mental and emotional evolution of Salman’s character from a pure Brahmin who can not even stand the aroma of non veg food from neighbors to walk into a mosque, wearing a bhurkah, walking into Dargah with the belief that offering prayers there would help the girl to meet her parents. there are few scenes whe re anyone would get goosebumps – when Salman saves the girl from the brothel place and at the background Hanuman Chalisa, when the girl meets her mother, the emotional message Nawazuddin sends through social media, the intense prayers/singing at the Dargah, the integrity of the police officers, and the climax scene when finally the girl gets to speak and shouts ‘mama’ at the border of India and Pakistan.